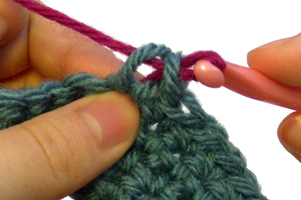 If you are new to crochet, here are some tips on how to change colors in your crochet work. The basic idea is to simply let go of the yarn you are currently using and pick up the new yarn that you want to use. Sounds easy enough, right? Let’s explore some examples! Suppose you want to change the color in the middle of a chain. Just let go of the color your are using and pick up the new yarn and hold it against your work and start chaining with it. Sometimes you may want to change colors after a certain crochet stitch. You change colors the same way, but you do it during the last step of a stitch. Here is an example using single crochet. Now let go of the yarn and hold the new strand of yarn against your work. Yarn over with the new color of yarn. 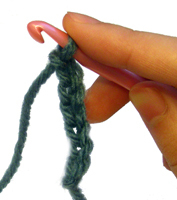 Pull the yarn though both loops on your hook. You can now use the new strand of yarn to continue your work. To change colors during different crochet stitches, the rule of thumb is to change the color during the last yarn over in the stitch. Sometimes you will find it useful to “carry” your yarn in your work. This is helpful if you plan to switch your color back to the previous color later. To carry your yarn in your work you change colors using the same method as above. 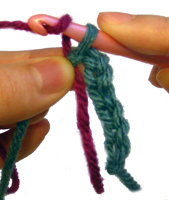 After you change colors, hold the old strand of yarn against the loops of your work. Now continue crocheting as you normally would with your new color. The old color will be carried in the work since it is being held against the loops you are crocheting in. When you are ready to change colors again the old color will be right there for you to use. If you need help changing colors in crochet, just leave a comment and I would be glad to help! This entry was posted on Thursday, April 23rd, 2009 at 4:35 PM by Rachel Choi	and is filed under Tutorials and Help. You can follow any responses to this entry through the RSS 2.0 feed. You can leave a response, or trackback from your own site. I am using two VERY contrasting colors and when I am carrying the yarn to change colors it is clearly visible inside the stiches….. Is there a different way to change the colors without cutting and knotting? If not then is there an easier and more permanent way to weave in the ends? Glad you said there is no right way, whatever works..There are patterns such as a star for example that you would like to do in one color & the rest in another. How do you do something like that?keep dropping & picking. Up the yarns of other color.Back & forth with the yarns ? Yes! That sounds like how I would do it. You can carry the unused yarn in your work. I have found a way to weave in ends as you crochet that is guaranteed not to unravel. 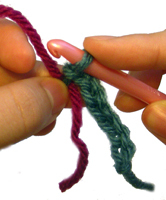 Once you have changed yarns, carry BOTH yarn ends for 2 or 3 stitches. 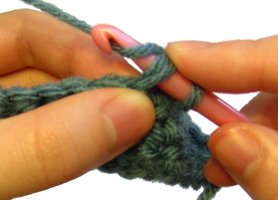 Then take your hook out of the current loop (you might want to pull that loop up a bit so it doesn’t come undone), then stick your crochet hook down THROUGH THE TOP of your previous stitch. What I mean is, if you turn your work toward you so that you are looking at the edge, you will see a row of v’s.. the front loops and back loops of the crochet stitch, with a hole in the middle. 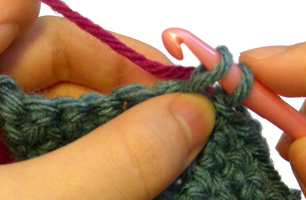 Stich your crochet hook in that hole, and push it down to where your loose ends are. 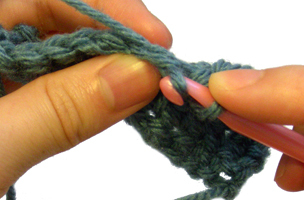 Grab your ends with the crochet hook then pull the ends up and out THROUGH the stitch. This will have your ends sticking straight out through your previous stitch. Then you continue along your current row. You follow the pattern as needed, and when you come back to those ends on the next row, you carry them again for a stitch or two, then repeat the process. After do this a couple of times, you repeat the process up to the point where you carry the ends for a stitch or two, then cut the ends. I have used this technique a couple of times, and I know for a fact it won’t unravel, because I have had to frog my work once or twice after weaving my ends this way, and when I ripped back to one of the points, I couldn’t rip any further until I pulled my ends back out from the bottom of the stitch. It may take a minute or two to do this in the beginning, but it saves a LOT of time in the end, especially because you will get used to pulling through the stitch as you do it more, and in the end it wont take but a few seconds to reach through, grab, and pull through. I just started learning to crochet and I am working on making some placemats to start with. When I get about 5 rows into my work the get shorter. What am I doing wrong? I do each row the same way but I am confused as to why it gets shorter? Please tell me what I am doing wrong. I think #1 – #3 in that post are your best bet. Hi Rachel im working on a pattern that needs me to change colors a lot somtimes just for a couple of stitches when i add and cut and weave tail are they secure and wont come un done even after washing ? and one more thing is it true your not to dry item after washing ? Hi Donna! Yes, once you weave the ends in and secure them they shouldn’t come undone in the wash. For peace of mind you can try doing it on a small crochet piece first and tossing it in the wash to see if it holds up. Some materials you can put in the dryer and others you shouldn’t, if you still have the packaging label for your yarn it should tell you on it. Hi Rachel! I was lucky to find your site and read about carrying yarn across the back of a piece. I didn’t know that you crocheted over it because nothing has ever said to do that. I love that idea because then you don’t have loose lengths of yarn to catch on things. Now, here’s my problem. I have run across patterns that say roll your yarn in to 3 balls, for example, because you are going to use a ball of a diff. color and leave it hanging during a color change. How do you keep those balls from rolling all over the place AND how do you know when you are 1/3 of the way through a skein? Is it just a best guess estimate? There must be a better way. I see in books that you should roll your yarn into balls all the time bit I just pull from the skein. Any help you can offer? I’m an intermediate crocheter but apparently my skill in this area is out to lunch. I also see this “small ball” use in knitting and you could have 5 or 6 colors dangling from the back of your work! Hi Leandra, try putting your balls of yarn in a box while you crochet, that way they won’t roll off the table and will at least stay in the box. A shoe box would probably be good, and you can also make a yarn container if you’d like. I think guestimating is good enough for when you need to split your skein, but if you really want to be exact you can weight your ball of yarn. If it’s a 1/3 of the weight of the total skein then you know you have what you’re looking for when splitting into thirds. You’ll need a scale that can do light weights though. You can also try measuring your yarn as you pull it out, but that might be more trouble than it’s worth. I hope that helps! The way I keep my yarn balls separated while using more than one for color changes is I put them all in individual small ziplock bags closed with just the yarn coming out, then I put those individual bags in my yarn bag and knit right out of it, that way they don’t get mixed up while I am knitting with them all! I use the small sized tissue boxes. The balls fit in good while I’l working, and they store nice and neat when I’m done using them. Depending on what size yarn you are using, a metal collander works well too…just pull each color yarn through it own hole and it keeps it from getting tangled too. Hi Rachel, so glad I came across your site. I would like to make the ALL FREECROCHET 4th of July afghan, for next year, I’m a little late for 2011. How would you change colors with the white star and blue background? I have used blue and white together before and found I can’t carry them because the colors show thru. But, looking at all the color changes on this chart, you would have lots and lots of ends to weave on every square. What do you think? Hi Connie, If you’re colors are showing through when you carry the yarn in your work, I would just cut the yarn each time you change the color instead. Yes, it will leave a lot of ends to weave in, but you’ll have a lovely afghan that I will hopefully be worth it! thx alot i’ve been trying alot of differnt ways but this one works out the best!!! I am making a two-color afghan which is many small squares sewn together for form a large block. The colors are cut across in the diagonal for the small squares and then the squares are used on both front and back side to form the pattern. I do not know how to carry the yarn up a row to switch to the 2nd color and keep it the same on both sides. Can you help me? Joyce, I think it’s suppose to look differnt on each side. There is a front and back side of the each stitch your make. You’re probably already doing it correctly. What I do is drop the yarn or carry it to where I’ll need it next, then pick it up on the next row. Hi, I would like some advice on changing colors when using a graph. I bought this really pretty afghan kit that has a snowman decked out for Christmas. They say not to carry the yarn more than 3-4 stitches but the colors change all over the place across the pattern because of shading. I’ve never used bobbins before or done this kind of work so I’m more than intimidated by having balls of yarn hanging from the back of my work as I go. Any advice that might make it easier? I sure don’t want to run out of yarn. It is hard enough to keep track of the rows I’ve done because the chart squares are so small. Love your site and await your response! If you are working from a kit, it is best to follow the advice given in the instructions from the kit. The kit most likely contains just enough yarn to complete the project and not much more if there is any extra yarn. Using yarn bobbins is not a bad idea if you have to change colors often and the kit comes with the bobbins. I have never crocheted anything using a kit. However one of my published designs (crocheted Noel wall hanging) was turned into a kit by the publisher because there were so many color changes often. When I crocheted the item I used a combination of whole skeins, yarn bobbins and small balls of yarn, depending on the area to be covered and how much of the same color or different color was needed for a particular section. If you don’t like using yarn bobbins, you may want to put each strand of yarn through a straw to prevent tangling. If you have enough yarn to work with and don’t like a lot of different colors of yarn attached to your work at the same time, you can work with one or a few colors at a time and simply cut the yarn not in use. However this can leave the back of your work (wrong side) very messy, unless you leave enough yarn to weave in all the loose ends, which can be very time consuming and may still look messy. You can also use a regular needle and thread to sew all the loose ends into place. Good luck and I hope I was able to help in some way. Oh my gosh Rachel im so glad i found you. im going to learn from you because I have been looking for the differnet stiches and you give them on your page.Im a new learner and you going to teach me Thank you so much. i want to know how to end the stitch after your done. Great tutorial! I’ve never changed colors like this before, but will definately give it a shot 😉 Thank you for sharing this technique with others. and repeats around the hat, with a slip stitch to complete the row, then ch1 and continue the pattern. The photograph shows the stripe as rather thick, but I can’t get my stripe to line up, let alone be thick! Can you help me?!?! I can even show you the pattern page if you like, but I’m not sure what your rules are here for your site. Thanks in advance! Hi Jennifer, are you changing colors like in this tutorial? Take a look at the “changing colors in crochet stitches” section, if you haven’t already. Also, in the pattern you are working on double check it to make sure there aren’t specific instructions as to how they want you to change colors. Some patterns may use a non conventional way to change colors to get the desired look. That’s a good idea to look on Ravelry. I hope you are able to figure it out. Good luck with it! Okay, Rachel. I found the culprit. In very small print (ie, I didn’t read everything), it says to do the color changing in “Fair Isle Method”. What is that?! Do you have a tutorial for that? Are you even familiar with it? I had no idea there were different “methods” of crocheting. I was just following the pattern as it was written and didn’t see in the explanation at the beginning to do the color changes a different way. Seems I got in over my head a bit. I went ahead and finished my hat with just regular stitches and it looks okay, but I’m ready to make another one because this one is too small. 🙂 Any help will be appreciated!!! Hi, Rachel. I recently did some projects that start out a crocheting in a round. When I change colors, it’s not a seamless transition between colors. Is there a different technique for changing colors when working in the round? Forgive me if this is mentioned elsewhere here… I didn’t happen to see anything that addresses this issue. Thanks so much… I really enjoy your website. Hi Debbie, most of the time when you’re crocheting in the round like a spiral the color changes won’t be seamless. It’s natural for this to happen. Other patterns, when you’re crocheting in the round and making the turning chain will have a more seamless color change. 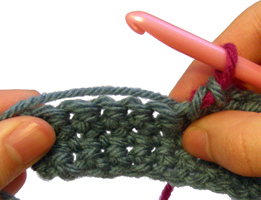 The different methods of crocheting use the same technique to change colors, but the method you crochet is what mostly determines if the color change will be seamless or not. 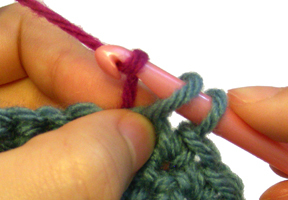 If you are crocheting in the round like a spiral, but want a smoother color change, you can try any slip stitch into the last stitch with the old color, and then change to the new color. Then change in stitch height helps to even out the color change. I’ve crocheted for years, just simple stuff, I must not have learned the correct way to change colors because I always looped the hook with the new color, as if I was starting a project, well, that caused problems, so I never tried to change colors often. Thank you so much, your website is great, even for people who have crocheted for a long time. I have never crocheted a granny square with an object in the center. I keep reading about droping one color & picking up another, but I don’t have a clue what you do to keep the back from being a big mess. The pattern I want to do doesn’t say whether or not you cut & finish off one color before beginning the second color but I don’t know any other way to do it. Sometimes I will only change color for 2 stitches. How do you do this type of pattern?? Hi Susan, you can carry the yarn in your work, as shown at the end of this tutorial. But for certain instances, like the granny square, it is best to cut the yarn instead of carrying it in the work. I’m crocheting a football afghan for my son from the Crochet Digest Magazine, Autumn 1999. There’s a lot of color changes sometimes only one stitch of white then 2 of green then 1 of white and so forth. My problem is that that many changes in such a short distance just looks like a mess to me. I don’t see any definition of the stitches and therefore I’m thinking that I’m doing the color changes incorrectly. I was wondering if you know of any tutuorials that show that many color changes and how to do it correctly? Another option for changing colors is a Russian join/knot. It helps when using colors that just do not carry well with each other. It is a slightly more time intensive while working but saves a good deal of weaving at the end. There are a few tutorials on youtube showing how to do this particular technique. Thanks for putting the left handed version!!!! So many people forget about us lefties and I had one heck of a time learning because people couldn’t teach me using my left hand! You are the best! Thanks! YES…Love the left handed version! Thanks! Sure makes it easier to follow. This method of changing color almost looks too good to be true. I am picking up crocheting after an absence; I used to do it alot when I was a teenager. Recently I have tried to change color by tying knots, but that presents some problems as you know… using your method, it doesn’t fall apart because we are not tying? 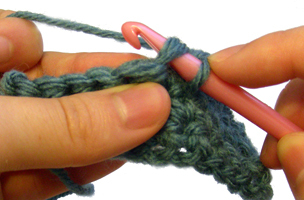 Crochet is basically a series of knots, so you are sort of tying a knot when you join a new color. If you are worried about it not being secure, you can tie the ends of the yarn together after you’ve used this method to join the new color. You’ll see that the ends of the yarn will hang out and need to be weaved into your work, so you can tie them together if you really want to. Hi Demi, when in doubt I like to cut the yarn. You can experiment and see what you like best though. I find that when you carry the yarn it makes the fabric thicker and sometimes, depending on the colors you use, the yarn will show through your work. So I don’t carry the yarn as much as I cut the yarn. It really is personal preference though! Sure thing! What seems to be the problem? Does the yarn get tangled or are you not sure how to work the color change? The color change is worked the same way on either side, it doesn’t matter what direction you’re coming from. 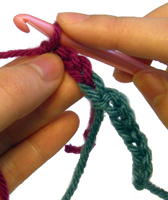 If your yarn is getting tangled, try cutting the yarn after you change the colors each time. You can weave the ends in your work so it doesn’t look so messy. Love the left handed pics! Also, I know how to carry and change colors, but where I have trouble is when you end one row and turn. carrying a color up the side. doesn’t look too good sometimes. I was wondering…. how do you change colors when you are ending with a sl st on one row, and then beginning with a chain on the next row? I am working on the Granny Ripple afghan (pattern purchased from Crochet Spot). I love it. Hi Wendy! You can insert your hook into the stitch to make you slip stitch (as you normally would), they pull the new yarn color through to finish your slip stitch. I am interested in learning and understanding the process techniques of changing colors, creating color designa such as Fair Isle Techniques, Jacquard Techniques, Intarsia Techniques, Taspestry Crochet Techniques, Entralac Techniques, dealing with the crochet process. I like your step by step instructions and I am saving it for further use. Thank you. Here is my problem and after looking through I don’t seem to find the answer above. I am making a College Footbal throw and it has a big T in the middle. I already have the graph to follow, but how do I make the rows looks even going up on the T and not look like it is uneven. I am working the way you describe and leaving the ball of main color at beginning of each row of the T. I hope I am explaining clearly. Thank you. Let me see if I can explain what I am saying better. Another words when crocheting the letter T (which is white). As I go to the next row and incorporate the next main color (orange) back in the two yarns show on the first stitch, so that when I go up to the next row instead of being straight up white it is orange and white. Is it because I am not correctly doing that first stitch of going back to the orange and or white? Does this help? I am thinking I wasn’t thinking I was changing the color correctly. Hmm… try to do the color changes using the techniques in this tutorial and see if that helps. Change the color at the end of the stitch before it’s needed in the next stitch. Also, be sure you’re not carry any yarn in your work as that may cause the other color to show through. When I change color, YO and finish the SC, does this count as the first stitch in the new color. My graph says 5 stitches, then switch back to main color. So, I’m using the main color, on the last stitch of the MC, when I have 2 loops on the hook, I YO with the accent color, when I pull through 2 loops to get one loop of the accent color, does this count as the 1st of five stitches, or do I need to do 5 SC after this change? I can’t get the SC of the accent piece to line up in the actual crocheted piece. I should be a square in and showing up as a parallelogram. All skewed off to one side. Hi Pat! It sounds like you are changing the colors at the end of a stitch, so that last stitch would count as the old color. You’ll need to make 5 with the new color after you change the color. HI Rachael, great tutorial, I’m saving it for the future use. Let me ask you this, when I change colors for the border (single crochet), once I come to connect the beginning to the end, the transition part doesn’t look nice and smooth. I tried playing around it, nothing works and I’m so frustrated. How do you carry around the corner? Hi Donna! You would carry it the same way you would in any other part of the project. Hold the unused yarn against your loops and crochet over it. Lol. I’ve been crocheting just over a year. This is how I change colors after giving up on many tutorials that hurt my brain and tied my fingers in knot. This is so well written that I’ve pinned it! I hope a thousand Crocheters find this and each lead a thousand more! My instructions say to “drop previous colour to wrong side of work. Do not carry yarn across row”. Does this mean to cut it off each time. It seems like a waste to cut each time. My patten invokes 3 stiches at the beginning of a row and three stitches at the end of the row with the same colour. Do you have a suggestion? Hi Ken! Are the flecks of the old color only at the one stitch you made the color change at or throughout the entire row? If it is just at the one stitch where the color change started, you may have to weave in the ends to give it the look you want. If it is throughout the entire row, it sounds like you are carrying the old yarn in your work which I wouldn’t recommend if you can see the old yarn. That technique only works for certain stitches that are tight enough to hide the old color. It is carried throughout the entire row. But the yellow is just from the stitch I’m crocheting on. How do you avoid carrying the old yarn? You can cut the old yarn, and if you need it again, reattach it later. I did earlier. At this point, where I’m having the issue, is where I’m not carrying the yarn in fact. There are dots of the old color in my normal stitches. Hmmm, it sounds like it might be normal if it is the color that you used on the previous row. If you want, you can email me ([email protected]) a picture and maybe I can help you better. It’s hard to tell what is going on without seeing it. So, I’m doing an afghan that is blue and white and starts with blue and then 2 white stitches and then almost to the end of the row and 2 more white stitches. Can I drop the white instead of carrying it all the way across? And do you leave it in the front or the back? You can do it either way. You can also cut the white yarn and restart it where you need it. Give it a try and see what method looks best for your afghan! I am crocheting an afghan with a striped cat image. It uses a chart and changes colors frequently during the row. It says “when changing color, do not finish off.” I’m not quite sure what that means. Do I cut the yarn when I change colors but not do a slip stitch and then weave them in at the end? If so, is that going to be secure? Or do I just carry the thread? Just very confused about the term. Hi Chris, it sounds like it wants you to carry the yarn in your work. “Do not finish off” typically means do not cut your yarn. Hi Rachel. Ok, I’ve done more reading and it actually says to “work last yo to prev st with new color,” which I understand. Then it says, “dropping prev color to wrong side of work. Do not carry yarn across row.” I took that to mean I should cut the yarn every time I change colors, but for several rows, this goes “A BB A BB A BBB A CCCCCC” and so on. I end up with a ton of ends to weave in, and I do not even know how to fit them into the nearby space. Two of the colors are black and white, so they do not hide easily. Am I supposed to be cutting them? Or do I knot them? You aren’t suppose to cut the yarn (you will have too many ends to weave in) and you aren’t suppose to carry the yarn in the work (they will show through). You will let it “drag” across the back of the work. It will look like a bunch of yarn lines on the back of the work when you are done. I’m trying to sc a white star onto a solid square of black or green. Can you help? Sure, I can try and help. What are you having trouble with? I have the star made. Now how do I crochet around it to make it a square panel ?? I would suggest crocheting the square panel and then sewing the star on top of it. You can crochet around the star, but it would take a lot of experimenting for you to do. Or you would need a pattern that already exists for it. Rachel, you are a saint. Thanks for all your patience. Trying your idea to change colors in crochet. What happens to the tail of the old color? Won’t it pull out? What a great tutorial. Lots of clear images and instructions. Changing colors seems hard, but it really isn’t and you’ve made it easy to understand. Thanks for sharing!